Everyone's heard of potassium, but beyond knowing that bananas are a good source, what else is there? There are a number of foods rich in potassium. Potassium is an electrolyte and can successfully counterbalance a diet rich in sodium. The mineral also impacts the body's muscles, mental alertness, and storage of energy. Potassium's symbol is K and within the periodic table, it is found in the 1st group and 4th period. Its atomic number is 19, while its weight is 39.0983. It comprises 2.4% of the Earth's crust and is essential to all living things. It can be found in all plant and animal tissue. 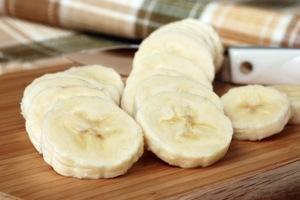 The recommended daily allowance (RDA) for potassium is 4,700 mg. It sounds like a lot, but potassium is abundant in a variety of foods -- in particular unprocessed fruits and vegetables. Thus, it's quite simple to meet the daily requirement. A baked potato, for instance, contains a whopping 900 mg of potassium. Did you know that this number is over 400 mg more than what is found in a banana? It's true, and it's just one fun fact about potassium. Bananas are a good place to start when discussing potassium. They have a reputation for being a very good source of the mineral, but in truth, there are many other foods with higher content. Perhaps the reason why bananas are so associated with K is that they're great for "on the go" situations, such as a late breakfast. It's much easier to grab a banana than bake a potato. You can get plenty of potassium by eating a varied diet. The following foods are good sources of potassium. Fruits and vegetables provide a number of vitamins and minerals, including potassium. Nuts and legumes contain many nutrients, including healthy potassium. Many animal proteins serve as a rich source of potassium. Dairy products are rich in a number of minerals, including potassium and calcium. Blackstrap molasses is very high in potassium. It contains 498 mg per tablespoon. A veritable batch of "did you know?" facts that will easily peak the curiosity of young learners and really anyone interested in health. It is an alkali metal (Group 1A). It is the second least dense metal in the group (lithium); so soft in fact that it can be sliced with a butter knife. It turns silvery in appearance when first cut, but quickly oxidizes into gunmetal grey. It melts at 63.38 °C, yet its boiling point is 759°C. It is the seventh-most abundant mineral in the Earth's crust and the third-most abundant mineral in the human body. It reacts violently with water, resulting in hydrogen; the hydrogen gas/solution is so potent it can ignite -- producing a marvelous purple-blue flame. It does not occur in nature because of its violent reaction with water. It is found in ocean waters, though less so than sodium. It is used in gunpowder and fireworks (potassium nitrate). It is one of 17 nutrients essential for plant growth; hence it is also found in fertilizer. Its name originates from Potash or "pot ash." Its symbol K is from Latin and stands for "Kalium." Potassium is an essential mineral. Including an array of potassium rich foods in your diet contributes to good health.